How to achieve a sense of unity in Aikido practice…and beyond – by Jacques Bardet Shihan. “To start this text, I would say, in a very simplified form, that the West gives priority to objective thought, it sees the world as a collection of separate elements. 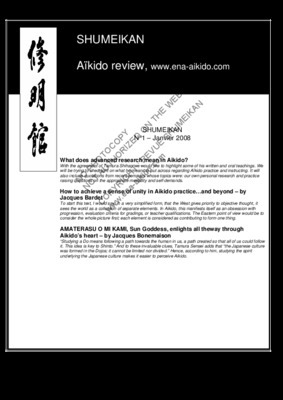 In Aikido, this manifests itself as an obsession with progression, evaluation criteria for gradings, or teacher qualifications. The Eastern point of view would be to consider the whole picture first; each element is considered as contributing to form one thing.”.